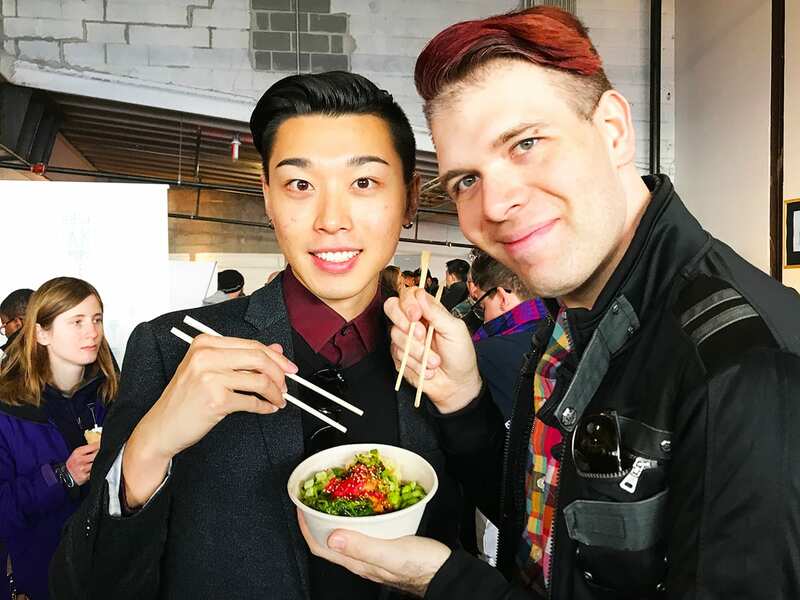 Unleash the taste buds at this year’s Emporiyum an annual food event that gathers some of the most culinary innovating and exciting places from Washington DC. This is our second visit to this annual event and every time its a blast, read more from our review of Emporiyum 2016 Baltimore. Explore some of the unique dishes like vegans cheese, spicy bowl, donut waffle, and so much more all under one roof in Union Market. Emporiyum is one of the only places you can do it all in one day. So make sure not to miss this annual event in Washington DC and Baltimore. Also, don’t forget to skip breakfast so you can try all the nomnoms, there are so many that even Nomster had trouble eating it all. I tried vegan meat and I liked it! very excited to try vegan sweet and sour pork seitan from Pow Pow a New Asian cuisine that brings Chinese, Japanese, and Korean techniques together in H Street Corridor neighborhood. This being one of our first dishes at EmporiYUM, it makes for a great entry. What really caught our eyes is their vegan and veterinarian selections. If you didn’t tell us it’s fake we would say Natalie Porkman (LOL) is meaty goodness. One very filling brown with grilled pineapple, green pepper, tomatoes, carrots, greens, and their signature rice. Rice was on point, well seasoned, soft, and flavorful that added to the overall dish. With a choice of sauce, we went for something with a nice kick to it. They also offer an assortment of other dishes that are gluten and dairy free. Who is your papa? 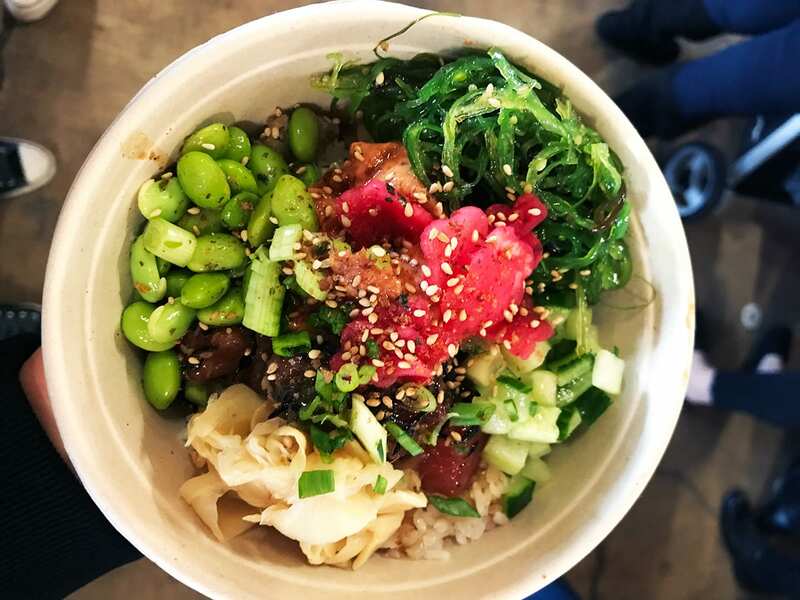 The Hawaiian inspired bowl is your new pap from Poke Papa a brand new poke place in China Town neighborhood Washington DC. Its a simple 3 steps build your own bowl of protein, toppings, and sauces. We couldn’t decide so went for both Ahi Tuna and Spicy Tuna. Really big fans of the spicy tuna, it had this nice heat to eat and flavor that made it quite memorable. Combined with pretty much their entire topping menu like seaweed salad, cucumber, edamame, pickled ginger, and more. Sriracha Aioli was our sauce pick for that little spice we enjoy. At the actual location, the ordering is slightly different, but its still build your own bowl with even more toppings, sauces, and proteins. The Poke Papa people were so excited to be at EmporiYUM and having us try their nomnoms. Such joy along gets them high marks. Its the creation of evil scientist, a tasty combination of Donut and Waffle together to bring us Doffle from B Too one of our favorite Belgian restaurants in DC. We are very familiar with this restaurant and dish, but we can’t pass up having it again at EmporiYUM. It has everything you love all in one bite, the softness of a donut and texture of a waffle. Plus glaze and sprinkles on top. That’s one way to make waffle even better, fry it, glaze it and FEED ME! Even if you missed this event, the Doffle is available at their restaurants. Get ready for taste bud blowing dish Veggie Okonomiyaki savory pancake from Uzu in Union Market, DC. This dish literary means “how you like” in Japanese as in its prepared the way you want it to. At Uzu they are bringing Japanese comfort food with a twist. It may not look it, but there are a lot of ingredients in there with cabbage, Bella mushrooms, eggs, tempura crisps, and scallions. Plus it topped with Japanese BBQ sauce, a Japanese brand Kewpie mayonnaise, bonito flakes (dried, fermented, and smoked tuna), aonori (seaweed), and shichimi togarashi (red chili powder). With the first bite, we discovered an amazing brand new world. It’s so soft and flavourful, that every bite brings joy to your taste buds. While soft its pretty heavy dish that will definitely fill you up. We were getting full, but couldn’t stop and finished the whole thing. No regrets when food is that good. This was one of the most memorable dishes we had during the EmporiYUM. 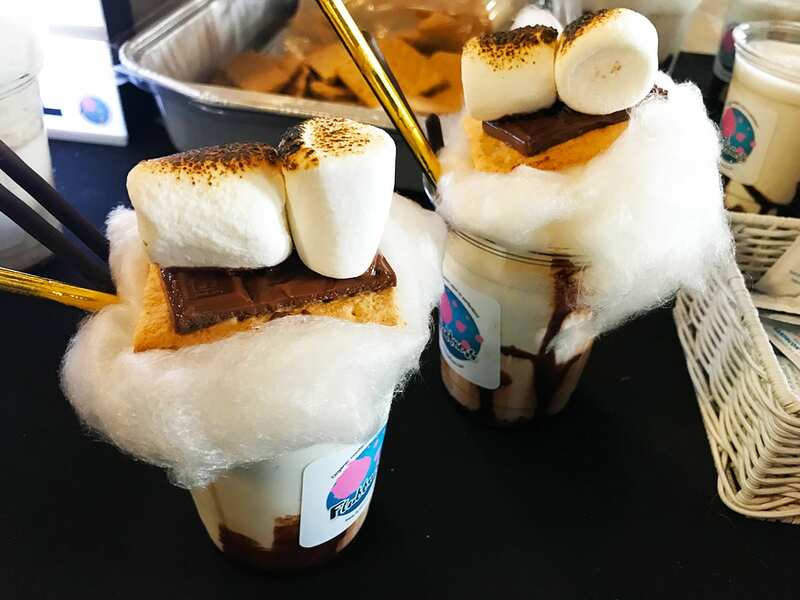 Its sugar overload with Cotton Candy Smores Milkshake from Fluffness, a company specializing in cotton candy, but making something much more at EmporiYUM. While their main product is cotton candy in a jar or at the event, they serve up some amazing milkshake. After all ice cream and cotton candy just not enough, so lets top it off with S’Mores! OMG, that was one of the most amazing milkshakes we’ve tried. Definitely worth all the calories, but we try not to think about. 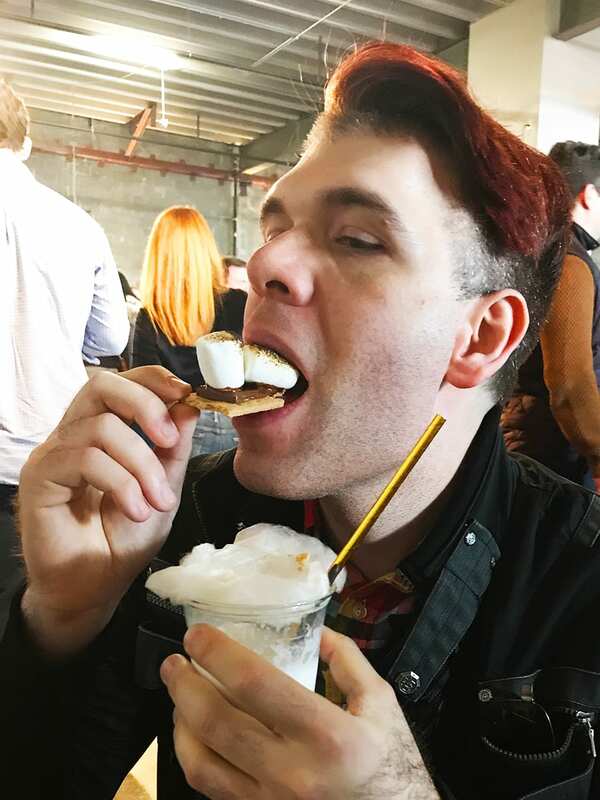 Sadly you can only find amazing creations from Fluffness at events, but we are in luck they sell cotton candy online in a jar or tub. Who doesn’t want a tub of cotton candy at home?! Very excited to try some authentic South African Beef Jerky from Ayoba Yo. You learn that the founder of this company was sad not to be able to have beef jerky from his homeland after moving to the USA. So what a great solution to create your very own company that can make you all the beef jerky you desire. I guess selling it to others is also a good idea. One of the big difference with other beef jerky is that this one is air dry which according to their representative is a much healthier way. We definitely enjoyed trying various flavors and looking forward to having more. Onigirazu is in the house and going for two most popular orders a Spam and Chicken Teriyaki sushi Burritos from Filling Good, a place that makes you feel good with nomnom food. These two little burritos sure pack a flavor punch. Another tasty little nomnom we enjoyed at EmporiYUM 2017. They might be small, but they are a whole lot of enjoyable and shareable. Instead of going one bug burrito, we went for half and half to try their two favorite flavors. Our favorite was the Chicken Teriyaki as it had a very nice soft texture and greater flavor combination. Especially went great with the spicy sauce. Currently, you can find them at Civic Plaza’s Farmers Market in Washington DC. Not very often you need an ID for ice cream, but that’s what happens when you eat liquor-infused ice cream from Tipsy Scoops, an ice cream just for grown-ups from New York City. We tried Dark Chocolate Whiskey Salted Caramel, Cake Batter Vodka Martini, and Raspberry Limoncello Sorbet. OMG, being an adult has never been this good. All were great and tasted like a nice refreshing mix drink, but more sugary goodness in there. We are big fans of the sugar so bring it on! Each ice cream had a nice liquor hint, it wasn’t too much and you are not likely to get drunk off it. We are a bit sad that this is an NYC based ice cream shop, but they do deliver their goodies. Maybe someday they will open a location in DC, cross our fingers. Get some sausages in your mouth, because we double sausage ourselves with an order of Devil’s Backbone and Bacon Sausage steam bun sandwiches from Milton’s Local, an all natural meat provider in Washington DC area. This place focuses on creating a sustainable agriculture with family farmers in the area. Always great to meet people with a passion for environment and food. Being gay foodies, we are big fans of the sausages and enjoy them all the time ;). You can’t have sausages and not expect some dirty comments from us. We are a fan of these sausages, they had a nice flavor and texture. They did get a bit lost in all the toppings, but still enjoyable. This is a showcase dish so, in the end, you will be buying sausages. So if you are into environmentally friendly and family-owned businesses make sure to check them out in your area. We ended our Emporiyum adventure with some drinks from Buffalo bergen which is located in Union Market as one fo the few full restaurants. Who doesn’t like few drinks, shots, and more S’Mores made right in front of us.